When you leave a job, you may have up to four options for any funds in your former employer's retirement plan: (1) leave the funds in the employer's plan, (2) roll them to a new employer's plan, (3) roll the assets to an IRA, or (4) take a taxable distribution. Although there may be good reasons to choose any of these options, rolling the funds to an IRA enables you to maintain control regardless of your employment situation. 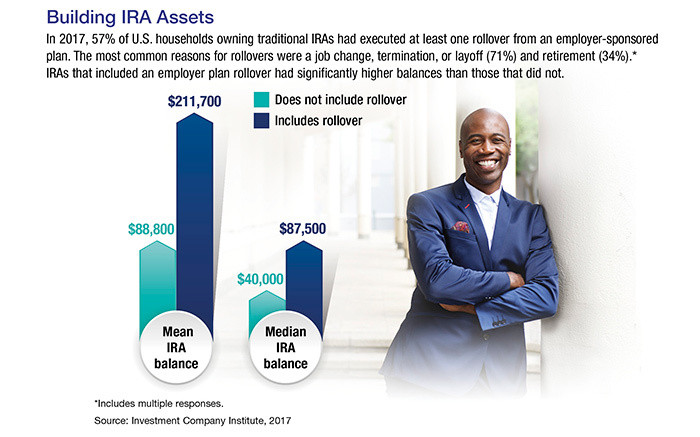 IRAs typically offer a wider variety of investment choices than employer plans, and you can combine rollover funds with any other funds you already have in an IRA. Or you could open a new IRA to receive the rollover. In order to avoid current taxation on the distribution, it is best to execute a direct rollover, also called a trustee-to-trustee transfer. In this type of transfer, you never actually take possession of the funds, thus retaining the tax-advantaged status. To execute a trustee-to-trustee transfer, contact the trustee of the old plan and provide information regarding the trustee of the IRA that should receive the transfer. The trustee of the old plan may execute an electronic transfer to the new trustee, send a check directly to the new trustee, or send you a check made out to the new trustee. If you receive a check, you should mail it to the new trustee as soon as possible. If you receive the distribution in the form of a check made payable to you, your old plan is required to withhold 20% of the taxable portion of your distribution. This will be credited as withholding when you file your federal income tax return. You can still execute a rollover of the entire distribution and preserve the tax-deferred status by making a deposit equal to the full distribution in an IRA within 60 days. But you'll need to make up the 20% that was withheld using other assets. For example, if your taxable distribution from the plan is $10,000, the plan will withhold $2,000 and you'll receive a check for $8,000. You can roll $10,000 over to an IRA, but you'll need to come up with $2,000 from other funds. Theoretically, you will receive the $2,000 as a tax refund when you file your return, assuming that all other tax liabilities are met. In general, the rules outlined above also apply to rollovers from one employer plan to another, from one IRA to another, or from an IRA to an employer plan. However, you can make only one tax-free, indirect 60-day rollover from any IRA you own (traditional or Roth) to any other IRA you own in any 12-month period. Each additional rollover would be considered a taxable distribution, which is subject to ordinary income taxes plus the 10% early-withdrawal penalty for those younger than 59½. This limit does not apply to direct rollovers (trustee-to-trustee transfers); nor does it apply to 60-day rollovers to or from an employer plan, or to conversions of traditional IRAs to Roth IRAs. The 20% withholding does not apply to distributions from an IRA, but you must still follow rollover rules to preserve the tax-deferred status. This information is not intended as investment advice and is not a recommendation for retirement savings.